Venezuela has made a formal request to the US to extradite a militant Cuban exile wanted over the downing of an airliner which killed 73 people. 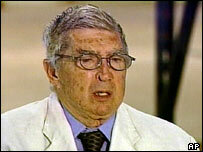 Caracas says Luis Posada Carriles is a "terrorist" and is urging the US not to protect the ex-CIA informant. The case has strained ties between the two countries, with Venezuela accusing the US of double standards. Mr Posada Carriles, 77, who denies involvement in the 1976 bombing, is in US custody seeking political asylum. "It is up to the state department to decide if it will protect a terrorist or not," said Venezuelan Vice Foreign Minister Delcy Rodriguez. The request was based on a 1922 bilateral extradition treaty and other international accords, said the Venezuelan ambassador in Washington, Bernardo Alvarez. He said the extradition process should not be held up by the immigration charges against Mr Posada Carriles. Mr Posada Carriles is currently in detention in Texas, accused of entering the US illegally after he was arrested in Florida in May. He is also wanted by President Fidel Castro's regime for a series of bombings of hotels in Havana in 1997. The US says it will not extradite people to any country which could then hand them over to Cuba. Mr Posada Carriles appeared before an immigration hearing in El Paso, Texas, on Monday, where he has applied for asylum. He told the court he had the right to be in the US and asked the judge to move his case to Florida so he could be closer to his counsel. He was remanded in custody until the next hearing on 24 June, where his request for bail will be reviewed.